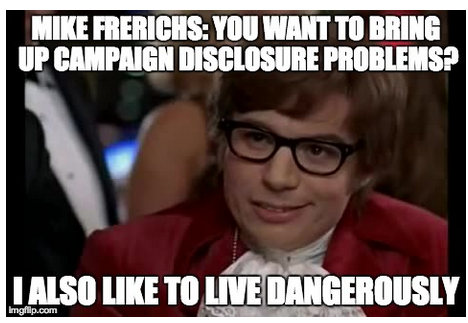 Wait..Mike Frerichs Wants To Talk Campaign Disclosures?!? *We* can talk campaign disclosures. How about the time - earlier this year - where the Mike Frerichs for Treasurer campaign got reprimanded by the Illinois State Board of Elections for obsfucating their campaign payroll? The Illinois State Board of Elections is putting a stop to a practice that's allowed political campaigns to hide some of their spending. The problem comes in that payments were reported as being made to the companies, not the individual employees. This seems to violate state campaign rules, which requiresuch payments be itemized by the ultimate recipient of the money. Rupert Brogsmiller, director of the State Board of Elections, says this kind of thing first became a problem years ago when credit cards became common. “You would have an expenditure to MasterCard or Visa, but it wouldn’t really explain as to how that money was actually spent,” Borgsmiller says. The payroll flap was first reported by the conservative Illinois Review website.